The resulting SVG file was extruded and rendered in Processing with Richard Marxer’s Geomerative and my RExtrudedMesh extension. OBJ export was accomplished with OBJExport. The model was printed on Makerbot Replicator with white PLA filament. The 3D model and the SVG graphic are published under a Creative Commons license. 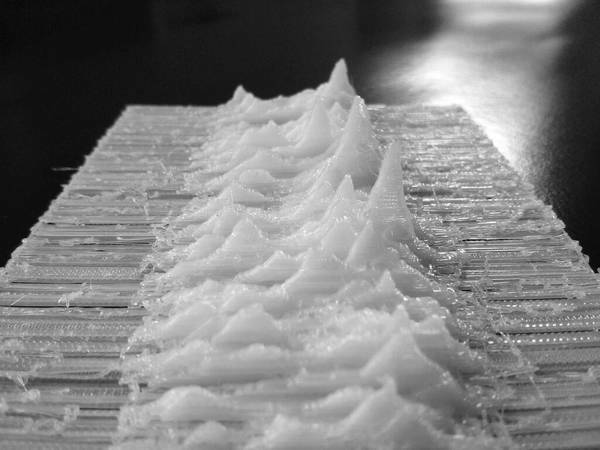 via 3D-printable model of the cover of Joy Division’s “Unknown Pleasures” – Boing Boing.